Mr. Josh Bullard graduated from Christian Heritage Academy in 1979. He then went to Bob Jones University where he received a B.S. degree in Mathematics. He also did graduate studies in Mathematics at the University of Oklahoma and received his Master of Education degree from Luther Rice Seminary. Mr. Bullard began teaching math and coaching at Christian Heritage Academy in 1984. 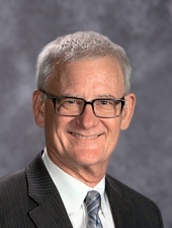 He soon became the math department head, the administrative assistant for the junior high, and coached football and basketball until 2006, at which time the Board of Trustees named him Headmaster upon the retirement of his father, Mr. Ralph Bullard. Josh and his wife, Genel, have 10 children, eight of whom are alumni of the school. They are members of Faith Bible Church in Edmond. Dr. Susan Demoss graduated from Bixby High School. She subsequently attended the University of Oklahoma, where she was conferred a B.A. in Mathematics, a Master of Education in Supervision and Curriculum, and a Ph.D. in Education Administration. Working in education since 1990, Dr. DeMoss joined Christian Heritage Academy in 2006. An excellent math teacher, she teaches calculus, college algebra, and trigonometry, classes which Dr. DeMoss was instrumental in establishing as dual-credit courses, helping students get a head start in college. In 2008, she was appointed Director of Professional Development, where she coordinates teacher evaluation, staff development, and curriculum alignment. She is Associate Headmaster. Susan and her husband, Mark, have 2 children, both attending Christian Heritage Academy. They are members of Capitol Hill Baptist Church, where Mark is also the pastor. Mr. David Holmes graduated from US Grant High School in 1969. He went on to attend Southwestern Oklahoma State University, graduating in 1973 with a B.S. in Physical Science Education. In addition, he has taken several graduate level courses in Education Administration at the University of Central Oklahoma and the University of Oklahoma. A long-time fixture of Christian Heritage Academy, Mr. Holmes arrived at the school in 1975. Over the years, he has taught math, geography, life science, earth science, physical science, biology, chemistry, and physics, along with several short term classes, covering topics like moral purity and college preparedness. Mr. Holmes also coached both boys and girls junior high basketball for 10 years and high school tennis for 15 years. He continues to be a leader in encouraging students to participate in missions, both local and abroad, and has been a leader on many trips to Mexico and other locales, including Thailand and Brazil. He started in administration 25 years ago in a part-time capacity, but it quickly transformed into a full-time position. Married to his wife Sandra, they have 5 children and 11 grandchildren. David and his family attend Heritage Baptist Church where he serves as an elder. Mrs. Tami Low graduated from Tecumseh Christian Academy in 1983. Subsequently, she briefly attended East Central University in Ada, Oklahoma leaving to become a full time stay-at-home mom. Returning to college in 1999, Mrs. Low attended Rose State College and graduated from the University of Central Oklahoma in 2003 with a Bachelor of Science degree in Elementary Education. Mrs. Low became acquainted with Christian Heritage Academy in 1993 through the homeschool satellite program. During her time of homeschooling, Mrs. Low felt the call to the classroom. At that time, she and her husband enrolled their three children in the CHA day school program and Mrs. Low returned to college to earn her degree which would enable her to teach at CHA. Upon graduation from UCO in 2003, Mrs. Low began teaching sixth grade where she taught for 11 years. During her time in sixth grade, Mrs. Low inherited Mr. Ralph Bullard’s seventh grade government class upon his retirement. As an extension of the government class, she expanded the sixth grade Washington, D.C. trip into the sixth grade American Christian Government Tour with a format similar to the American Christian Heritage Tour the seniors take each year. Mrs. Low earned the designation of Master Teacher on August 13, 2007. Tami and Darrin, her husband, have three children, all graduates of CHA, and five grandchildren. They are members of Destiny Christian Center where she serves in the Destiny Jr. Kids Ministry.